State Sen. Bob Duff addresses a group of about 10 people, including Darien's Democratic Former First Selectman Evonne Klein at the Darien Train Station on Monday afternoon. 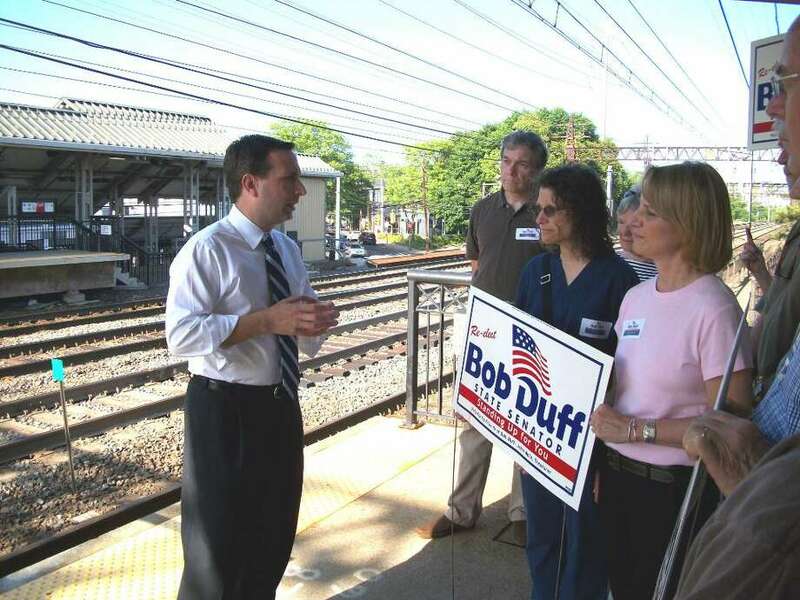 State Sen. Bob Duff, D-Norwalk officially announced his candidacy for re-election in the state's 25th district at the Darien Train Station on Monday afternoon. Duff is seeking his fourth term in the state senate, representing Norwalk and Darien. About 10 supporters gathered on the station's northbound track to greet the senator, who discussed the four major reasons he decided to seek a fourth term. Running for re-election is "not like putting on the morning coffee," Duff said. He told the crowd that he believed it is not an automatic action a politician should take; he is seeking re-election because he feels as though his work is not finished, he said. The key issues he plans to focus on during his candidacy and his fourth term if elected are: the creation of jobs; the environment; transportation; and helping constituents. Creating jobs is a multi-pronged project, he said. One key element in this project is examining education within the state. "Connecticut is a place that lacks natural resources to create jobs," he said. While other states have more land, or resources such as coal mines, Connecticut is rich in "human capital," according to Duff. "We produce smart people ... and we continue that by making education our top priority," he said. Duff recently helped co-sponsor the Race to the Top Grant, which will bring $175 million into the state from the federal government over the next four years. Duff said he's also conscious of the need to spend money as efficiently as possible. "I feel I've been a very strong fiscal watchdog," he told those in attendance Monday. Additionally, he said he would continue to fight for the environment, "to make sure we continue to work toward cleaner air, cleaner water and a less toxic environment for our children." He had to pause during his comments several times for passing trains and tooting horns, as he stood just a few feet away from the Metro-North Railroad line, bringing commuters home from their workday. "I believe transportation is still one of the most important issues for Fairfield County," he said. "I'm going to make sure those rail cars are here." But it's not all about making laws, he said. It's also a legislator's job to work with individual constituents to help them meet the needs in their day-to-day lives, he said. "I really do enjoy the job, and serving both the communities of Darien and Norwalk," he said after his announcement. "It really is an honor to serve."